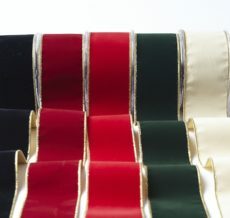 May Arts carries reversible ribbons in a wide variety of sizes & colors. Create an elegant look with our reversible satin. Or add a touch of whimsy with a reversible stripe or polka dot! Our sheer reversible is perfect for Christmas, whether you are decorating or gift wrapping.